The equine racing world is so lucky and blessed to have Dr. Patricia (Patty) Hogan in its corner. Hogan could have been a model or actress. Not only is she gorgeous (both inside and out), she is also brilliant and one of the best veterinarians in the nation. Born and raised in the suburbs of Edison, NJ, Hogan knew as a little girl what she wanted to be when she grew up. “I think I was born in love with horses, for it is the earliest thing I can remember,” Hogan said. “ \I would draw pictures of a horse and gallop around the house whinnying. I was quite the tomboy and preferred playing with GI Joe rather than a Barbie doll. Hogan treats approximately 3,000 horses every year, performing surgery on about 700-800. Besides operating on them, Hogan also sees many of her 4-legged patients for various other ailments such as pneumonia, eye injuries and leg infections. 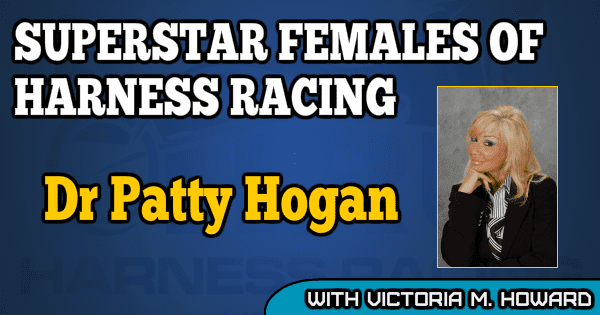 Besides Always B Miki, Dr. Hogan has treated some of racing’s best — both standardbred and thoroughbred. “I’ve been so fortunate in my career to care for some of racing’s best, but the horse who remains number one in my heart is Smarty Jones. His hard luck story and amazing personality were so endearing and taking care of him opened a lot of doors for me. “Smarty was an unproven 2-year-old who reared up at the Philadelphia Park starting gate and badly injured his eye. He was referred in for an emergency eye removal because it appeared he had ruptured his left eye. When he first came to me his head was very swollen due to air under the skin that escaped through multiple skull fractures. “His left eye was swollen shut with some bleeding tissue protruding from the lids. After doing an ultrasound and radiographic exams, I was relieved to see that he did indeed have an intact eyeball deep within his skull and orbit. We wrapped his entire head (hence the nickname Quasimodo) and treated him aggressively with medications. Smarty Jones and Always B Miki are just a few of the superstars Hogan has treated. “I’ve cared for Tapit, Mine That Bird, Afleet Alex, Take Charge Indy, and of course harness racings champion Always B Miki. Miki is an extremely talented athlete who had to overcome two very serious limb fractures. I first met Miki the morning after the 2014 Breeders Crown when he was scratched after fracturing his LH pastern while warming up. He could not walk on that limb so I personally drove to Showplace Farms to put a splint on the leg so he could safely travel to the clinic for surgery. “The fracture was displaced and severe, but he recovered nicely. Six months later, he was training well and just about to qualify when he broke the RH pastern. I then repaired that fracture with 4 screws and designed an accelerated rehab program to try to safely heal the fracture, yet keep him reasonably fit to make the fall races. What advice does Hogan have for horsepeople on how to help keep their horses reasonably sound? Hogan spends most of her free time at her home, a beautiful 40-acre standardbred breeding farm located in the heart of New Jersey’s horse country she shares with her husband, trainer/driver Ed Lohmeyer. Together they maintain a broodmare band of 10-12 mares and breed and race horses on the circuit. Her practice, Hogan Equine, is located at the Fair Winds Farm, right across the street from her home where she can be found performing orthopedic and soft tissue surgery, digital radiology, ophthalmology, lameness evaluations and others. From myself, Always B Miki, Smarty Jones and all the others you have cared for — thank you Patty Hogan for everything you do. And to the chief of surgery, this Yankee is a superstar.